It has always been difficult to find out the exact object if we don't exactly know the name or type of an object. 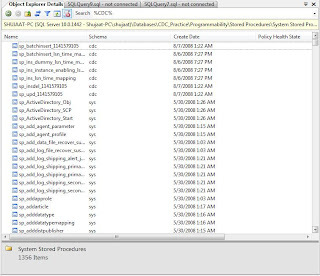 In SQL Server Management Studio 2005, it is impossible to search any object because no such option exists in the first place. As a database professional, I don't remember the names of all the objects all the times. I may remember what the name should be like but not the exact name. If I know the exact name, I don't remember whether it is stored procedure or function (if there is no naming convention). To resolve all these problems, I need a search tool within the management studio environment. SQL Server 2008 seems to answer our prayers by providing 'Object Search'. The feature is available as part of 'Object Explorer Details'. This window can be used independently and also with 'Object Explorer' window. This provides primitive search of database objects in SQL Server 2008. By 'primitive', I mean it has several limitation which would be felt by professionals using this tool. To search any object, just type in the search bar in 'Object Explorer Details' window. There is wild card character available. This is same i.e. '%', which means zero or more characters. This character has the same behavior as T-SQL. Object Explorer Details window can run in isolation or with the Object Explorer window. 1. It is not possible to search a particular type of object e.g. you can not search all stored procedures starting from 'CDC_'. 2. It is not possible to search negation e.g. we can not search all the objects which does not contain 'CDC_'. 3. Software professionals are generally comfortable with regular expressions for search. Regular Expressions are not supported for search.